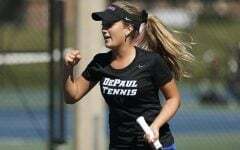 The friendly trash talking between Northwestern and DePaul began nearly one month ago when, at a media luncheon, Northwestern head coach Joe McKeown had his team introduced as the only school to have beaten all the other Chicago area schools last season. McKeown, being from the tough love city of Philadelphia where trash talking is treated as an art, touted his team’s 82-79 upset victory over the Blue Demons. 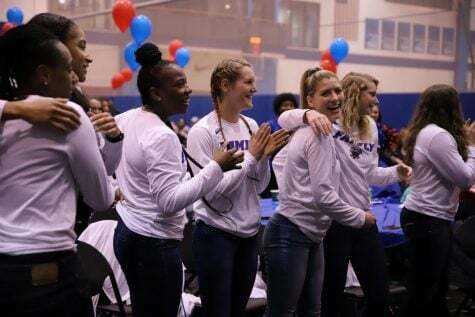 When it was DePaul women’s basketball head coach Doug Bruno’s turn at the podium, he didn’t let the jab go unnoticed. 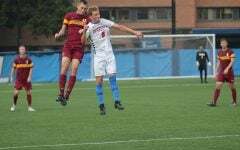 But on Saturday, Northwestern again came away with bragging rights in another pain-staking loss for the Blue Demons. Northwestern forward Nia Coffey scored 23 points and grabbed 17 rebounds to lift the Wildcats in a 97-91 double overtime victory. This time, however, the loss was on DePaul’s home floor of McGrath-Phillips Arena. The No. 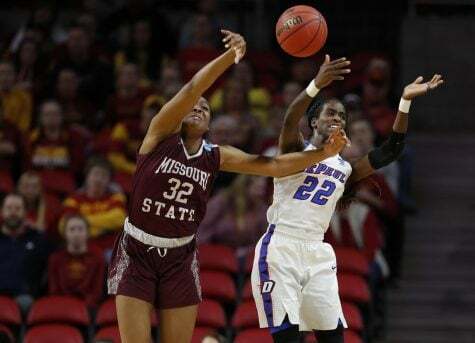 18 Blue Demons (4-2) couldn’t overcome a poor shooting performance in which they shot just 33 percent (36-95). 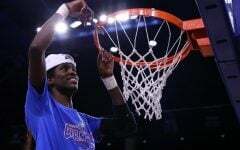 From the beginning, DePaul’s offense looked out of sorts. The team began the game shooting 20 percent (4-20) over the first five minutes, trailing 11-10. 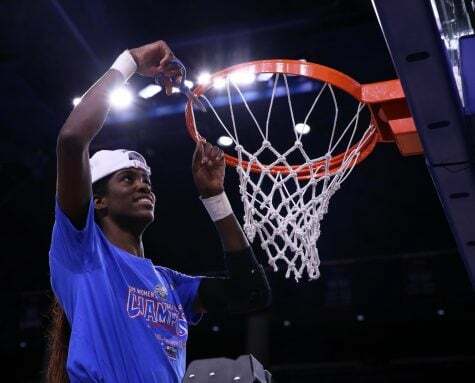 But even more so, DePaul lacked the crisp passing that usually leads to easy layups. The Blue Demons had only 16 turnovers, but a season-low four fast break points. Northwestern (5-0) also shot nearly 53 percent (38-72) and had four other players besides Coffey finish in double figures. The Wildcats often broke DePaul’s full court press, which seemed to lack the communication and timely rotations that ended up making stops. Yet, the Blue Demons were in the game at the end. 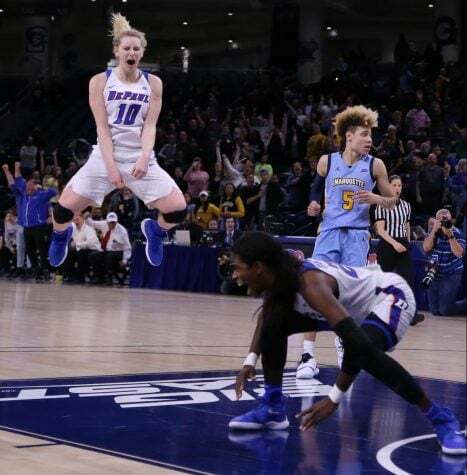 DePaul guard Brittany Hrynko sent the game to overtime with an in-stride layup down full court in the final five seconds of regulation, tying the game at 73. Hrynko led the Blue Demons with 19 points and six assists. DePaul, who trailed at halftime 38-37, opened up a 56-53 lead with 13:35 left and seemed to be getting back in a groove. The Wildcats answered back with an 11-0 run, capped off by a Lauren Douglas (15 points) jumper to give Northwestern a 64-56 lead with 10 minutes remaining. 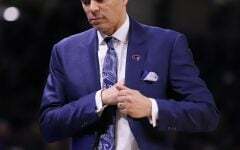 Bruno said the run was an example of DePaul playing at their worst, having uncharacteristic collapses on defensive rotations and bad shot selection. In overtime, the two teams continued to trade baskets that each felt deflating to the other team. 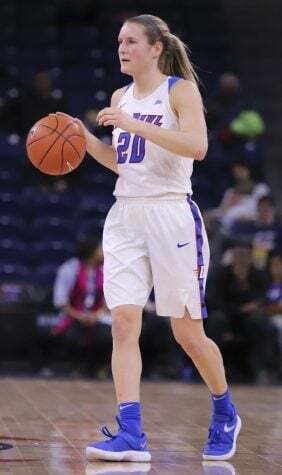 Hrynko gave the Blue Demons an 82-79 lead just under two minutes off a an and-1 opportunity, but Northwestern guard Ashley Deary hit a 3-pointer to tie the game on the following possession. The teams went into a second overtime tied at 82. In the second overtime, it was all Northwestern. 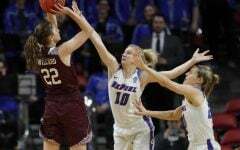 The Wildcats jumped out to an 86-82 lead in the first minute and the closest DePaul could get was 90-89 with a Megan Rogowski layup with 2:33 remaining. It was Deary again, this time hitting a jumper to put the game out of reach with 39 seconds left to take a 94-89 lead. Deary finished with 19 points. Rogowski finished the night with 14 points. Along with Rogowski and Hrynko, Jessica January (18 points) and Megan Podkowa (16 points) had solid nights for the Blue Demons. 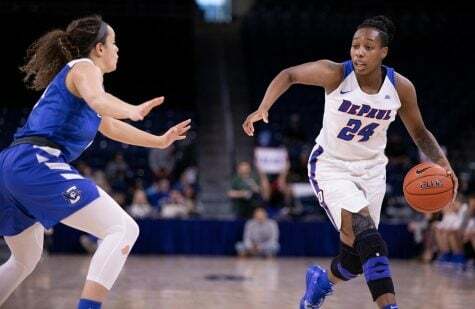 Starting guard Chanise Jenkins also returned from a right ankle injury, but struggled with six turnovers and shooting just 3-12 for seven points. 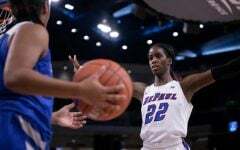 Like last year’s defeat to Northwestern, the loss could remove DePaul from the Top-25 by The Associated Press. In the first meeting, then No. 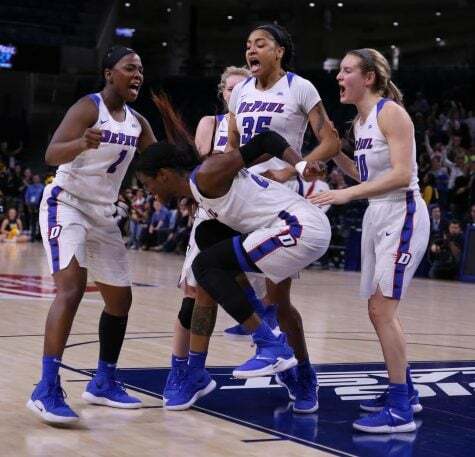 25 DePaul was removed from the rankings and it took all season for the Blue Demons to earn their way back into the Top 25, ending the season at No. 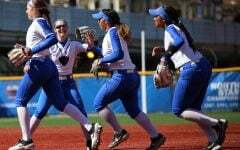 23 after clinching the Big East regular season title. 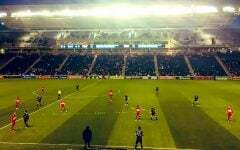 The loss, in the long run, was beneficial to the team and Bruno repeatedly said last season that the loss at Northwestern was a defining character of their season, even if he was joking with McKewon at the luncheon. Bruno, though, made no guarantees that this loss would have the same effect for his team. “We’re going to find out what we’re going to learn from this,” Bruno said. “We can’t answer it tonight. We’d like to think that since we had this lesson a year ago, we wouldn’t have had to have this lesson twice. “They gave us a lesson a second time, but we’ll find out what we’ll learn,” he said. 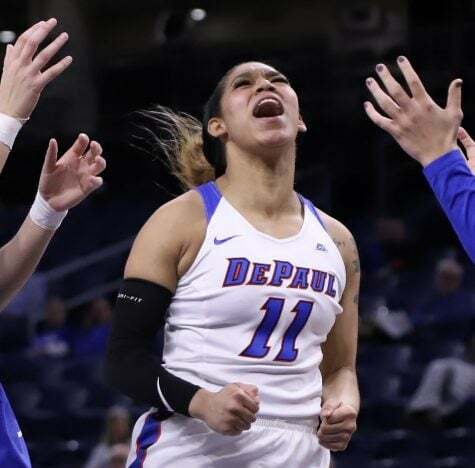 DePaul returns Wednesday with their first Big East game of the season, taking on Butler at noon at McGrath-Phillips Arena.